Update, February 1: Dragon Ball FighterZ has hit two million worldwide shipments and digital sales. 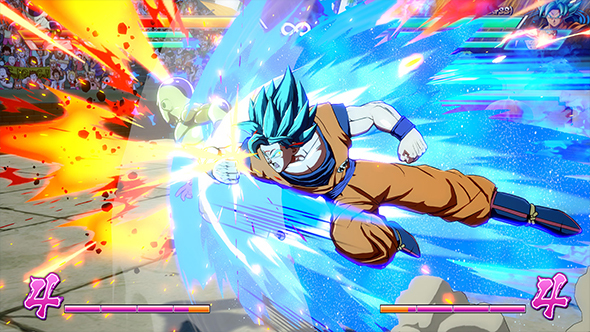 Dragon Ball FighterZ’ success has continued unabated, with two million worldwide shipments and sales, making it the first game in the series to do so, Bandai Namco has announced (via Gematsu). Original Story, January 26:Dragon Ball FighterZ is already the most-played fighting game on Steam – ever. The PC version ofDragon Ball FighterZ was slightly delayedfrom its console counterparts (and it even took an extra hour at the very end), but the delay doesn’t seem to have at all dampened players’ enthusiasm. Not even two hours after the game finally unlocked at the time of this writing, DBFZ is already the most-played fighting game in Steam history. And it’s not even close. Dragon Ball FighterZ has rocketed up the Steam charts, already up to 44,298 concurrent players in-game. (For those keeping track at home, that is indeed over 9,000.) That dwarfs the records posted by games like Tekken, Street Fighter, and Mortal Kombat, proving once again that people really like Dragon Ball. For the other relevant comparison, previous Dragon Ball games on Steam had been successful, but not to this degree. The first Xenoverse game hit a peak player count of 22,782, and Xenoverse 2 got 13,570. The combination of traditional fighting game style and fan-favorite characters seems to have pushed FighterZ over the edge.